Guinness World Records defines more than 25 separate categories for domino-related records. As an intermediary and contact point for Sinners Domino Entertainment, the German Records Institute has also established itself as a focal point for domino records at a local level. This page is a continually updated reference point showcasing domino world records as they come and go. As twelve-time record holders across the various domino disciplines, we have for several years been a cooperation partner for both records bureaus. If you need are seeking assistance in preparing your world record event, please feel free to contact us! The classic: the idea is to topple as many dominoes as possible in one single chain reaction. This record was established on the set of the European Saturday night show: Domino Day, which was broadcast live in 13 countries. The most dominoes toppled by a single person in one single chain reaction. This record was set during the New Year celebrations of the Chinese TV broadcaster ‘Beijing TV’. Liu Yang took six weeks to set up her attempt. This is the largest single domino field ever constructed and brought down. It consisted of 1,011,732 individual dominoes and was part of the chain reaction for Domino Day 2018. In contrast to the record discipline ‘Largest Domino Mosaic’, this category specifies the motif to be shown on a portrait. 150, 174 dominoes were needed to depict Steve Jobs over a 72m² area. The construction alone took almost four days to complete by our 18-member team on the set of the ‘German Domino Record 2015’. The largest domino spiral fell on 9th September 2016 at an event organised by TPT Domino e.V. in Denkendorf (Baden-Württemberg). The spiral took 7 minutes and 50 seconds to fall in its entirety. (Note: the attached photograph depicts a former record). On 11th August 2017, exactly 80,432 dominoes fell in just five seconds to break a new world record at the ‘German Domino Record 2017’. Only a year earlier, a record of 76,017 dominoes had been held in America, having left Germany after the category’s introduction in 2014. On the set of the ‘German Domino Record 2015’, exactly 11,466 dominoes were brought down on 15th August in a domino motif constructed under water. The dominoes used had to be heavier than normal in order to stand still; otherwise, they conformed to all standard domino dimensions. Entirely submerged in water, the dominoes fell as if in slow motion to break the former record. Incidentally, the discipline was introduced only a year earlier at the German Domino Record 2014, when 10,489 dominoes set the bar to beat. A world record in miniature format! During our summer event on 12th July 2013, we successfully set up and toppled 2,000 miniature dominoes in sequence (1cm x 0.5cm x 0.2cm). Since construction by hands alone would have been impossible, each individual domino stone had to be placed using tweezers. This record attempt was also witnessed and confirmed successful by a Guinness World Records judge during the filming of the British TV programme ‘Officially Amazing’. Incredible, but possible: During the construction of the ‘German Domino Record 2014’, we stacked exactly 1,055 dominoes on a vertically standing stone. It was forbidden to use either a glue or a supporting structure in creating the stack, which had to stand freely for at least one hour after construction. The stack also had to reach a height of at least 37cm. Also broken on the set of the ‘German Domino Record 2017’ was the record for the ‘Largest Domino 2D Pyramid’. The structure reached a height of over three meters for the first time ever, which was a particular challenge insofar as the structure had to be prevented from tilting to either side despite a depth of just 4.8cm. - Officially recognised by the Records Institute for Germany and under official review by Guinness World Records. 18,447 dominoes have created the largest ever 3D Pyramid structure, constructed by Kevin Pöhls and Tobias Demuth in Waren, (Müritz) Germany. Pöhls had already competed for such a record in 2014 as part of a duo team from Switzerland, but the record stood for only a week at the time. On 14th February 2015, he broke through again. The record for the 3D pyramid is considered by domino experts to be the most difficult of all disciplines, since one single mistake may likely lead to the collapse of the entire structure. The 40 meters and 14 centimetres longest domino wall in the world was brought down on 22nd March 2016 in Tulln, Austria, and consisted of 42,173 individual dominoes. The use of glue was naturally forbidden and the structure was required to fall freely in its entirety. In order to be valid, the construction also had to be at least one meter tall. (Note; the attached photo shows a former record). 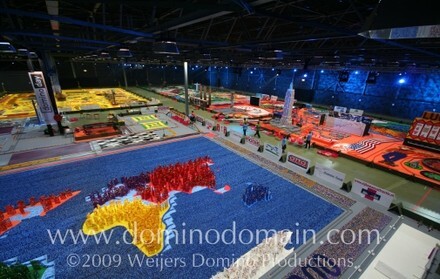 The largest field of dominoes constructed in Sominod form consisted of 16,199 stones and was 5.5 x 3.6 meters in size. Sominod describes a design in which dominoes are placed obliquely against each other on their edges. (Note; the attached photo shows a former record). - Officially recognised by the Records Institute for Germany. The tallest ever structure built entirely out of dominoes was brought down on 21.04.2014 in Buchloe, Germany, and was more than nine meters in height. It therefore had to be set up with the help of a hydraulic crane. Adhesives and other scaffolding or constructions to give the tower stability were, of course, forbidden. (Note; the attached photo shows a former record). The largest height surmounted by a single domino series on a specially-made construction was 11.52 meters, also set up during ‘Domino Day 2008’. To reach this height, no additional mechanisms were permitted. This record describes the largest fallen domino stones. The unique consideration, however, was that the first domino in the chain reaction had to correspond to the standard size of 4.8cm x 2.4cm x 0.7cm. (Note; the attached photo shows the former world record from 2008). The fastest ever moving dominoes covered a 30-meter track at an average speed of 7.13 meters per second during ‘Domino Day 2008’ and were built in the so-called ‘T-Setting’ technique, which is considered the world’s fastest way to bring dominoes down. This record describes the longest time in which a circular domino chain remained in motion. During the preparations for Domino Day 2008, 60 domino constructionists repeatedly laid 15 domino pieces at a time to continually reconstruct a circular chain reaction, which remained in motion for over 35 minutes. An alternative possibility within the world of chain reactions is to use traditional wooden sticks, as used in popsicles, by interweaving them under tension. When one stick is removed, the energy rapidly discharges and causes the entire structural compound to explode. On 22nd March 2016 in Tulln, Austria, a total 40,910 sticks were used to this affect, setting a new record for this category. The construction was created within a day by a 22-man team from Austrian Domino Art. ... domino pieces placed in a minute stands at 75; laid by Gemma Hansen (England). ... domino pieces placed in 30 seconds stands at 60; laid by Patrick Sinner (Germany). ... dominoes stacked in one minute stands at 55; stacked by Silvio Sabba (Italy). ... dominoes stacked in 30 seconds using chopsticks stands at 40; stacked by Silvio Sabba (Italy). ... dominoes stacked in 30 seconds stands at 48; stacked by Silvio Sabba (Italy). … domino pieces placed in one minute by an 8-member team stands at 260; laid by the team „Shuzo“ of Sinfonia Technology Co. Ltd. Team Building Events in Ise (Mie) (Japan). the world record for the fastest ...built five-storey domino pyramid falls at 18.40 seconds; constructed by Silvio Sabba (Italy). ...vertically-stacked domino pieces in one minute stands at 38; stacked by Silvio Sabba (Italy).